RUCKER, Daniel H. (1812-1910) Promoted to First Lieutenant in 1844, and to Captain in 1847, for his gallantry at Buena Vista in the Mexican War he was breveted Major. In 1849, he transferred from line to staff and was thereafter associated with the Quartermaster Department. He was promoted to Major in August 1861 and during the Civil War was breveted Major General in both the Volunteer Service and the United States Army for "diligent and faithful service," and "faithful and meritorious service." The procurement and distribution of wagons, horses, ambulances, mules, harnesses, forage and the thousands of other items needed for the transportation of an Army do not afford a potential for heroics; nevertheless, the Quartermaster's Department was one of the most, if not THE most, efficiently operated of the War Department Bureaus, and he seems to have ably seconded his chief, Major General Montgomery C. Meigs. Upon the reorganization of the Army in July 1866, he was named Assistant Quartermaster General of the Army with the rank of Colonel, a post that he occupied until 1882 when Meigs, who had headed the Bureau since 1861, retired from the Army. On February 13, 1882, he was appointed Quartermaster General of the Army with the rank of Brigadier General and ten day later was himself placed on the retired list. Rucker was one of the officers who escorted President Lincoln's body from the Peterson House to the White House following his death in April 1865. 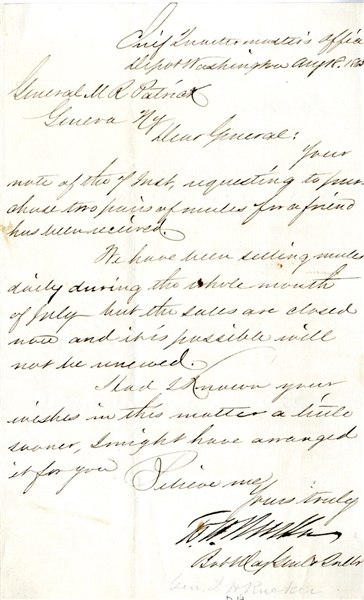 War-date Manuscript Letter Signed “D.H. Rucker” Bvt Majr Genl, 1pp. octavo, August 18, 1863, addressed to General Patrick, and reads “We have been selling mules daily during the whole month of July but he sales are closed now and it is possible will not be renewed...” Fine condition.